An open air meeting and celebration of the boat community. There will be music and speeches from the boater community, alongside trade boats, bunting, banners, balloons and placards… and much more. This is during a time when the Canal & River Trust (CRT) plans to refuse full licences to lawful boaters who “don’t move far enough”. Along with refusing licences, CRT plan to issue some boats with a more expensive and shorter 6-month licence, on the condition that CRT will only give full licences once the boater changes their ways. For one reason or another many of us move around various parts of London, and that is our right. 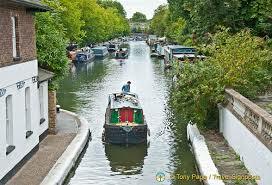 But CRT plans to set requirements that go beyond the British Waterways Act 1995. This Act clearly states how often boats should move, but does not state any minimum distance that we have to travel nor follow any specific cruising pattern beyond the stated 14 day limit. We must not allow CRT to debilitate our community. 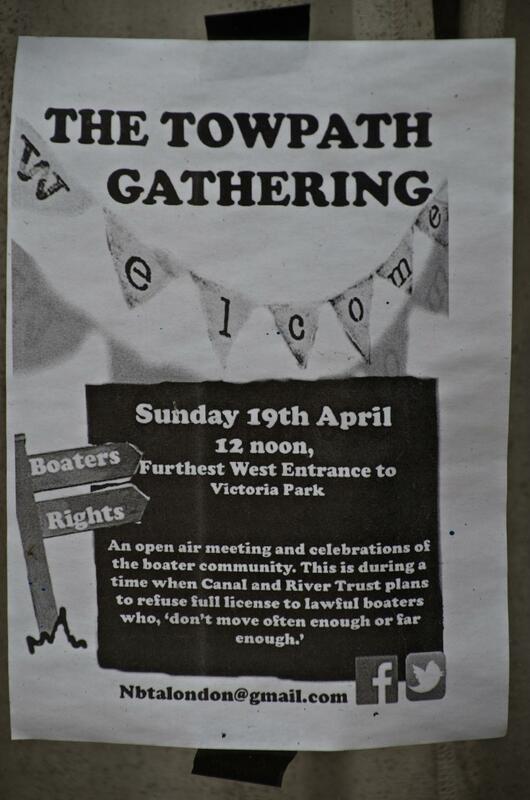 Please show your support at the Towpath Gathering. Currently the 14 day limit in the 1995 British Waterways Act should be the legal underpinning of any enforcement that CRT takes against boats without a home mooring. The main legal powers available to CRT amount to Section 17 (ii) of the BW Act, which states that CRT must license boaters with no home mooring as long as they use it “bona fide for navigation (for the period of the license) without remaining continuously in any one place for more than 14 days or such longer period as is reasonable in the circumstances.” In other words, boats without a home mooring have to move to a new place at least every 14 days. How this works in practice is that CRT have the power to reasonably interpret the legislation and enforce boats that they consider to have broken it. At the end of the process CRT can apply to the County Courts for ratification – or permission – to use their section 8 powers to remove the boat from the waterways. The enforcement process involves several stages and it is advisable to not ignore letters or emails and to try to negotiate with CRT to be removed from the process. The London NBTA can give further advice on this and there is special protection for livaboards, disabled, elderly and pregnant women. If court action is threatened, the London NBTA can assist the boater with finding proper legal representation. “From 1 May 2015, when the licence for a boat that doesn’t have a home mooring comes up for renewal, we’ll look back at its cruising pattern to determine whether it’s appropriate to re-licence the boat again as a continuous cruiser. If, at the time of renewal, we’re generally happy with a boat’s cruising pattern over the course of the previous licence period, then we’ll issue another continuous cruiser licence straight away. Of course, if during the period of the new licence we become concerned about the boat’s cruising pattern then we’ll let the boater know. Boats that have hardly moved during their licence period won’t have their continuous cruiser licence renewed. For the first few months after 1 May 2015, while boaters are getting used to this new approach, we’ll give those in this category another chance to establish an acceptable cruising pattern by issuing a three-month licence. If, after this three-month period, they still haven’t moved far enough then they’ll have to secure a home mooring before getting a new licence. How far is “far enough”. For a start it’s important to keep records and dates of your movements. This isn’t strictly required by law, but as CRT data of your boats movements may be unreliable, it is probably a good idea. Move to a new place every 14 days unless there are good reasons not to – such as ill health or mechanical breakdown – and inform CRT’s local enforcement manager by phone and follow up email o0f your intention to stay longer. If CRT contacts you and tells you they are only going to offer you a new licence with a reduced term of six or three months then challenge this. Reply to the letter by email to the address given on it. Be firm and polite and provide details of your cruising pattern and state that you believe this to be within the law. Ask for your CRT sighting data if you haven’t already got it. Ask why they have refused to renew a full license. State that you if you do not receive a satisfactory answer will be raising this as a formal complaint. If the reason is already given as ‘not moving far enough’, then ask how far they consider being far enough. CTR may also offer to give you ‘guidance’ on an individual cruising pattern. If this guidance is reasonable and you believe that you will be able to comply with it then it is your decision whether to accept this. If you do not accept CRT’s decision not to renew your licence for a full 12 month term because you believe that their interpretation that your cruising pattern over the course of the last year as not bona fide is unfair, or if CRT will not negotiate and are threatening to not renew your licence and you wish to continue living on your boat on CRT managed waterways, then you need to seek legal advice. London NBTA and the National NBTA can give you the contacts for a free legal advice line run by solicitors experienced in Canal and River law and section 8 cases in particular. What happens if my licence is not renewed? CRT will ask you to remove your boat from the water. Seek legal advice as above because if you live on a boat on the canal that is unlicensed, CRT will summon you to a County Court and ask the judge for permission to remove your boat from their waters. You may be liable for costs if permission is granted. Seek legal advice if you intend to go to court. In court you can challenge CRT’s decision not to renew your licence. On the agenda is what should we do about the new licence terms and conditions and the new enforcement policy. We will be discussing monitoring and potential events and activism. Also we have been contacted by TV news crews about the new enforcement policy and this will be discussed too. We will also be discussing the forthcoming legal advocates case officer training course and how to volunteer.